Want to know what goes on behind the scenes at MANIA®? Interested in the drama, the laughter and the tears? Want to attend those coveted Staff Assistant parties where free RYKA shoes, MANIAs, CDs, clothes, videos and more are tossed around like confetti at a campaign parade? If you are dying to hear the stand-up comedy routine from the dynamic duo of Denise and Sara while enjoying the wine – yes, the wine … we can’t forget the wine – come be part of the elite team of hard-working, dedicated and a little-bit-cRaZy Staff Assistants that keeps MANIA® humming. One of the biggest perks: the savings. Yup, as a Staff Assistant, you save $160 off the $259 MANIA® price, and you can attend any certification for 50% off – even sponsored certs like Tabata Bootcamp! And don’t forget about the CECs – yes, you can earn ALL your CECs/CEUs whether you work a session or go to it during your free time. You won’t miss more than one session a day (if at all), and every session is free for you to attend and audit. Only Staff Assistants have in-and-out session admission! Staff Assistants get access to the SCW Member Room all weekend long for free coffee and snacks, a free T-shirt, 20% off at the SCW Expo Booth and a one-year SCW membership, which comes with a whole other set of perks! Load-in Team, Prep-Squad or Turn-Around Team: The responsibilities of each of these positions leaves a Staff Assistant free to attend any and all sessions at MANIA®! Door Monitor: Work only one day of the three-day conference and get the other two days to do as you please! Booth Staff: Not only do you get to attend pretty much every session, you also get a whopping 50% off at the SCW Expo Booth! Host/Hostess: This position requires shopping. Yes, you read right. This job is for shoppers! Photographer & Videographer: Can you say fun?!? Tammy Harris is a dancer at heart – she was a dancer for the Houston Rockets as well as a former dance instructor for several years. But it wasn’t until Harris was approached by a comrade who encouraged her to create a cardio dance workout before she decided to step outside of her box and try something new. From there, Harris began to brainstorm and created a class. With popular exercise movements gaining notoriety, Harris knew that she would have to create a unique cardio workout in order to stay competitive in the market. 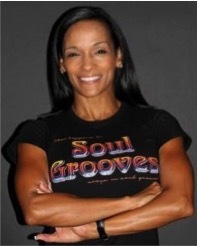 In 2009 came the creation of Soul Grooves® – a 60-minute cardio dance class that focuses on the mind, body, and soul. Harris found that a huge reason for the quick growth of Soul Grooves® was because of what she delivered through the microphone in each dance class. Already an experienced dancer, the creation of Soul Grooves® allowed her to transition into a fitness instructor. She is a cheerleader, fitness instructor and inspirational speaker rolled into one. “Typically in the group fitness industry, a large class is considered 50 people. 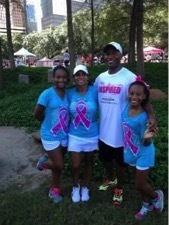 Soul Grooves® workouts bring in more than 200 participants,” Harris said. The growth created a need for Harris to hire more fitness instructors. She now works with a team of professionals, whom she describes as “amazing.” Classes are held at various locations in Houston, Dallas/ Ft. Worth, Baton Rouge, Lafayette, Chicago, and Denver every Monday through Saturday. Several workouts attempt to market themselves as being good for the mind, body, and soul – but for Soul Grooves®, it’s the foundation of the entire workout. “Our workouts are very high-energy and fun; it’s really a happy place – and it’s like that every class,” Harris said. The Soul Grooves® experience increases endorphins in the body and creates a better digestive system, which relieves stress and fights against heart disease and cancer. There are multiple benefits for those who continue with their Soul Grooves® workouts. Group fitness classes can seem intimidating to newcomers. Many visualize people in tip-top shape doing extremely advanced exercises in a routine manner. Newcomers often feel as though they won’t be able to keep up, will feel embarrassed, or will even pass out from exhaustion. Harris said during their busy Saturday classes, it’s common to see participants of all different ethnicities, ages, genders, and fitness levels – it really is a workout for everybody. Once participants see others doing the workouts, they will gain the confidence that they can do it as well. Soul Grooves® has a firm focus on uplifting the community through volunteering, outreach, and being overall good stewards of the community. Soul Grooves® has helped its own in numerous ways – from providing meals for needy families for Thanksgiving; hosting toy drives for Christmas; sponsoring backpack and school supplies for kids and assisting with paying utility bills. Harris said Soul Grooves® does its best to help any need that is brought to their attention. Soul Grooves® – It’s more than just a workout. It’s a way of life. It’s a mind, body and soul experience. I often walk into a club and watch trainers and instructors using the BOSU® Balance Trainerand wonder, “where are they getting their education?”. While most of the time I am impressed by the way they are incorporating the Balance Trainer into their programming, many times, I am baffled by what I see. There are many ways to find information these days. With the use of search engines, social media, and sites like YouTube or Vimeo, we are able to access information whenever we want. Just search “BOSU” on YouTube or Vimeo and you will see hundreds of videos of the BOSU®Balance Trainer being used by a variety of fitness enthusiasts and in a million different ways. Some show entire workout routines, while others focus on a specific exercise or movement. It might seem that because there are so many easily accessible “resources” for fitness pros to tap into for BOSU® ideas that bypassing live workshop or training courses would be a smart choice? Well…as it turns out, that just isn’t true. First, let’s discuss the risks associated with what you might find on YouTube or Vimeo. Unless the video was made and distributed as Official BOSU® Education, you really don’t know what you are getting. In other words, the exercises you might be seeing may or may not be recommended for use with the BOSU® Balance Trainer. Anyone who has attended an official BOSU® Certification course understands the intent and the benefits of using the Balance Trainer for functional balance training and, more importantly, how to make those critical exercises accessible by a wide variety of participants. When you watch a video of an untrained instructor demonstrating a BOSU® exercise they “made up”, you cannot assume the person understands the intent, the risk versus benefit, or ways to safely and effectively weave the drill into a progressive program. So, if you haven’t gone through proper training on how to integrate the tool into your programs, simply copying what you see online might make your workouts new and exciting, but potentially dangerous and unfulfilling! This morning I watched a video of a trainer demonstrating a weight bearing exercise while standing on the flat side of the BOSU® platform. If you turn over your BOSU® Balance Trainer, you will see that it clearly reads, “Standing on platform not recommended.” In fact, this is covered during BOSU® certification course and in all BOSU® workshops. The other concern I had was over the trainer’s suggestion to lift heavy weights while standing on the unstable surface. This honestly isn’t the point of integrated balance work and could lead to injury. Ultimately, when the risks outweigh the benefits of an exercise, both safety and effectiveness are compromised. There are several official BOSU® videos available online. These are videos led by BOSU® Master Trainers and members of the Development Team, and demonstrate the proper use of the Balance Trainer in both group fitness and personal training applications. Unless the video has the official BOSU® logo on it or says it was produced by BOSU®, you should carefully consider the credibility. Period. To be safe, if you must rely on virtual resources, use the BOSU®YouTube or Vimeo channel and learn as much as you can about our suggestions about safety and effectiveness. Of course there are advantages to learning and researching online. To top the list, it’s convenient. We all have busy lives and obligations making it hard to attend a live workshop, certification course, or conference in person. And, from time to time, we all get desperate to find something new and exciting to bring into class. Sure, it’s easy to simply Google “BOSU®Exercises”, then grab and go! But, what’s the downside to just using as is? Hopefully, you take the time to practice the exercise and think (critically) about how you’ll incorporate it into your programming, come up with progressions and regressions, and decide if it makes the cut. If you take these steps, is it really that time efficient. There are clearly advantages to attending workshops and certification courses in person. One might argue that they don’t have the 2 hours to attend a workshop or the 8 hours to attend a certification course, but you have to look at the big picture. After attending the foundational BOSU® Complete Workout System Certification, you will walk away with 5 full classes that you can simply re-deliver, and and you will learn a system to create additional classes and modify those classes for all levels. After attending a full certification course, instructors and trainers have the tools to create a class in record time without having to “google” anything. When I factor in the time saved month after month, week after week, and day to day in planning my classes or training sessions, I see that the 8-hour day was well worth it! The primary advantage of attending any live workshop vs. watching a video online is to have the ability to ask questions of an industry leader or master trainer. You can’t ask a YouTube or Vimeo video clip a question or have the instructor in the video watch how you perform or teach an exercise. Additionally, you don’t see how other people in the room are able to handle the exercise being taught. In a live workshop, the interaction with other fitness professionals is a vital part of the learning experience. Finally, there is science. Oh yes, I wasn’t going to end this blog without mentioning my favorite thing. Most videos are short and don’t give complete information. Being a “certified” trainer means that you understand the science behind the movement. Learning and understanding the exercise physiology behind balance training is absolutely critical to your success in leading workouts that use the BOSU® Balance Trainer. The BOSU® Education Team is committed to your success as a fitness professional. In 2016, the BOSU® Compete Workout System 8-Hour Certification Course is being offered as a pre-conference course at many conferences and in host clubs across North America. If you are interested in finding a certification course or workshop near you CLICK HERE or if you are interested in hosting BOSU® Education courses at your club or studio, CLICK HERE. And you can always connect with us at www.BOSU.com. Many trainers have mastered the science of exercise and program design – gathering the necessary health and fitness information (Investigation Phase), mapping out a plan (Planning Phase) and then implementing the program (Action Phase). Unfortunately, where we generally fall short is in the skills and abilities we possess in developing rapport and communicating effectively with clients (Rapport Phase) and this becomes very evident when watching trainers first meet prospective or new clients. Figure 1 – Key responsibilities to successful professional relationships. As illustrated in Figure 1, rapport-building is an initial and ongoing process, yet omitted by many trainers who direct their initial conversation towards understanding an individual’s needs and goals (i.e., gathering information) rather than making a connection. Not that this is negligent in any way, but it is important to remember that rapport is instrumental to building successful professional relationships. It is more than being polite and empathetic – it is the process of taking the time to actually show that person how much you care about them by developing close and harmonious relationship in which you ultimately understand their feelings and ideas, and can successfully communicate openly and effectively to help them attain what they need and truly desire (1, 2). It is a relationship marked by harmony, conformity, accord, and affinity, and without it, the overall relationship can stifle (3). However, it is also important to recognize that not everyone seeks or cares for rapport, at least not initially, and herein lies the true art of being an effective communicator. Strong communicators are skilled at quickly recognizing personality trait(s) (e.g., sociability, dominance) and ascertaining how much rapport in initially appropriate by adhering to the cardinal rule of treating others the way they want to be treated, rather than the way they would like to be treated. As fitness continues to migrate into wellness, the trainer of tomorrow will evolve to coach as well as train. Although this will necessitate the acquisition of additional knowledge and skills, this increase in scope of service will undoubtedly boost the relevance and value of fitness professionals who will then exert more influence in supporting and empowering individuals to achieve their unique goals and sustain change. However, non-athletic coaching and training are distinctly different and in NASM’s recently-released Behavioral Change Specialist (BCS) certificate (2) these differences, as well as the key roles and responsibilities of coaches and trainers are outlined. 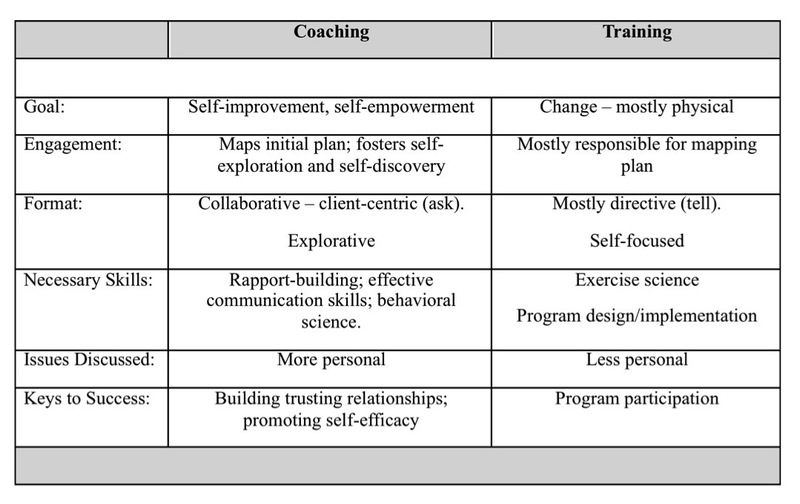 Table 1 illustrates some of these distinctive differences and demonstrates how coaching is heavily reliant upon rapport, strong communication skills and empowering sustainable behavioral change. Open – your mind (attitude) and body. This is not the time to be judgmental or adversarial. Open you mind – your ‘righting reflex’ or desire to inform and/or educate will come later. Orientate your body (belly button, heart) towards the person to demonstrate your genuine interest in learning about them. Eye – maintain a relaxed look as it instills comfort. Emphasize the social gaze, the triangle between the eyes and mouth and spend 80-90% of the time in this area. Although averting one’s eyes while a person speaks conveys mixed messages ranging from submission to disinterest, allows be attentive to cultural and ethical differences. Beam – a genuine smile and even laughing are deeply rooted with making stronger interpersonal connections (i.e., bonding). It increases brain activity, releasing various compounds (e.g., endorphins, dopamine) that builds more pleasurable experiences. However, smiles must be genuine as fake smiles are identifiable. A natural smile causes a slight eye wrinkle (action of the zygomatic muscles) and an upward lip turn – whole point of saying cheese. Practice holding a pencil in your mouth between your lips (not teeth) to activate these muscles. Hi – your salutation and handshake gesture. Personalize your initial dialogue by using the person’s name a few times – helps you help you remember them as well as any memorable stories about them. The handshake conveys a tremendous amount of information about a person; the firmness of the grip, the orientation of the hands, the use of the second hand, willingness to shake (germaphobe) and more. When in doubt, slowly extend a palm-open and upward-facing invitation and when the person starts to reciprocate, change your hand orientation to meet so that both hands are aligned vertically with the floor. Lean – Your body orientation should convey interest and connectivity. Lean slightly forward towards the person while respecting personal space (18 – 48” is ideal in most cultures), and then subtly match you movements. If a person does not gesture much, yet you do, this may prove to be distracting, as does fidgeting or adjusting your body position while they are speaking. Tune in next week to learn some techniques for ways to evaluate and self-evaluate our communication strength and weaknesses! Learn more about what Bruce and Mindy make for breakfast, lunch and dinner at a MANIA® near you! www.scwfit.com/mania.